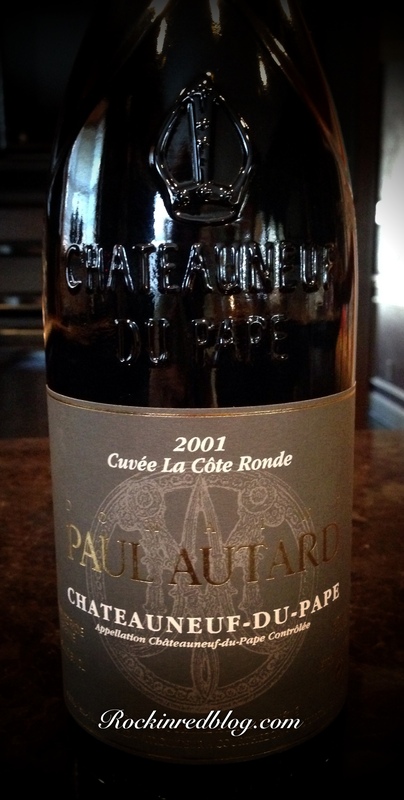 Domaine Paul Autard Châteauneuf-du-Pape 2001 Cuvee La Cote Ronde: This gorgeous wine poured opaque garnet with an orange rim and elegant viscosity into the glass. This CNP was crafted of 50% Grenache and 50% Syrah. After being open for two hours it met the nose with a lovely bouquet of vibrant red fruit, chocolate, leather and wet tobacco leaves. On the palate it seduced the front of the mouth with ripe red cherries, plums, pomegranates and crushed blackberries; it danced across mid palate with layered flavors of spice wrapped in chocolate; and lingered on the back of the tongue with earthiness, tobacco leaves, black pepper and a hint of black licorice. Its age showed in its smooth, velvety mouth feel, refined and elegant tannins with round acidity that lingered on the palate, longing for another sip. This CNP was a perfectly refined, dense and smooth. 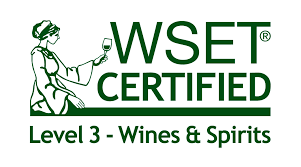 We thoroughly enjoyed it with food and also as a meditation wine; it was a joy to feel the fullness of the wine caress the palate. 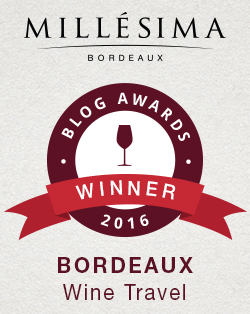 It was a great anniversary wine; an excellent recommendation to us and one I gladly recommend to you. 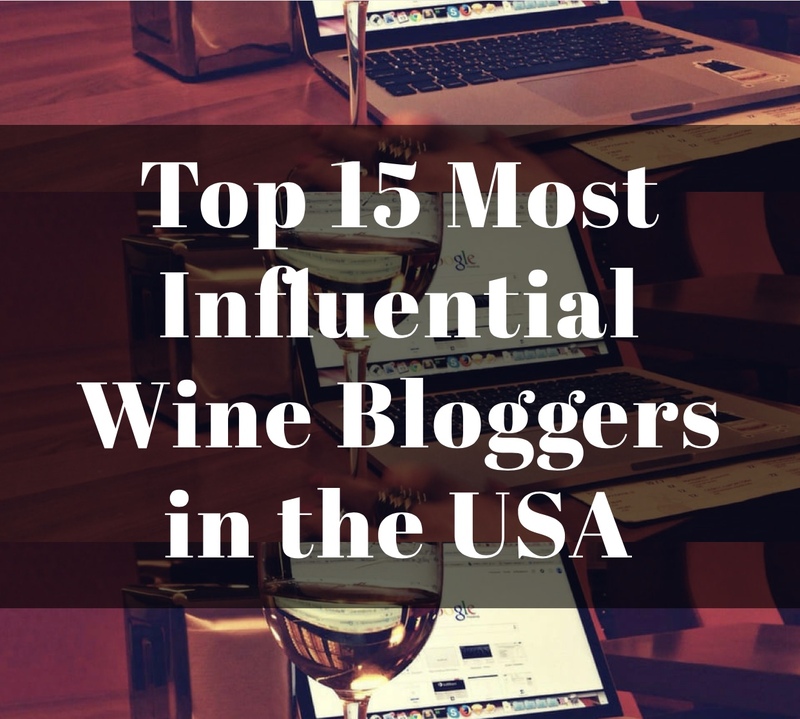 To find this wine in the US click here. I wanted to make herb crusted steak to pair with this concentrated wine so I began where I often do: Pinterest. 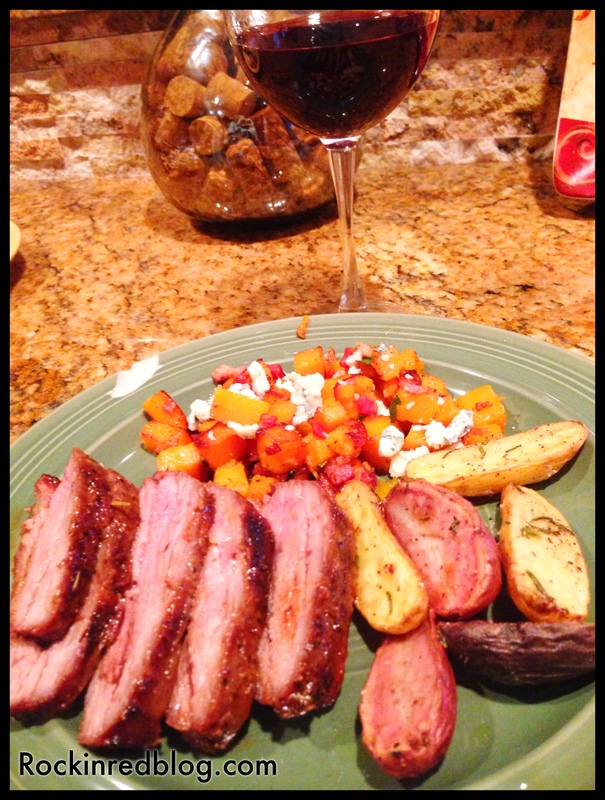 I found a delicious recipe for Herb Crusted Tri-Tip that you can find on my Pinterest page. I paired the steak with oven roasted fingerling potatoes with rosemary and olive oil and roasted butternut squash, cubed and steamed for 3 minutes in chicken broth in the microwaved, then sautéed with diced pancetta, finely chopped shallots and topped with crumbled gorgonzola. The herb crust on the steak that was seared on due to high temp grilling paired beautifully with the spice, pepper and earthy flavors of the wine, while the potatoes and squash mixture balanced out the concentrated fruits and chocolate. Additionally, the creaminess of the cheese delighted as the acidity of the wine wrapped around the mouth. It was a perfect food and wine pairing if I do say so myself! Because we had cake for our first anniversary dinner and were going to have dessert the following night as we went out for dinner, I had not planned on a dessert with this evening’s meal. But I must confess when I see macaroons I buy macaroons! 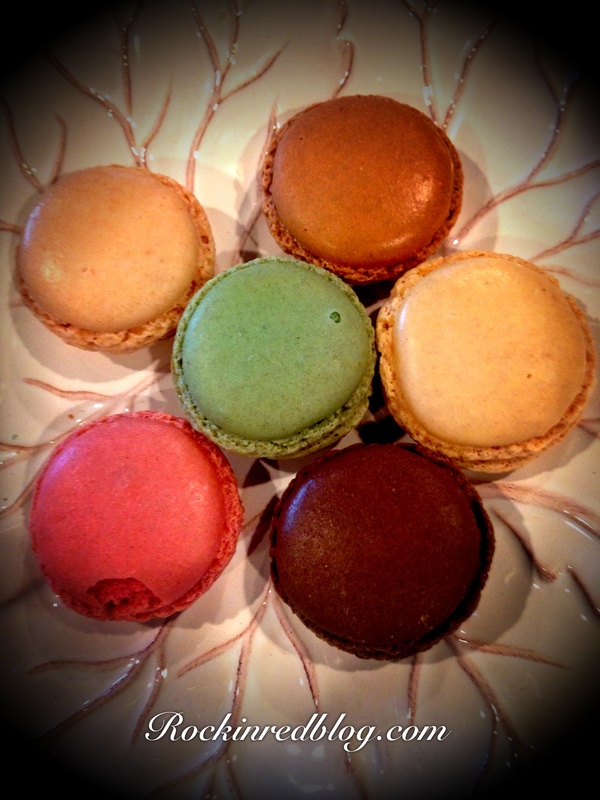 So we shared six delicious macaroons. And of course they were great with the wine; all that was missing was sitting in Trocadero Square gazing upon the Eifel Tower! My Song Selection: Pairing songs with my anniversary is one of the easiest song pairings I do for these articles. There are an endless amount of songs I would dedicate to my husband. 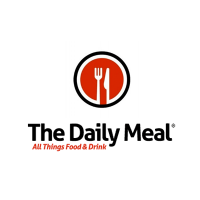 For this second of three articles the song I chose to pair with this wonderful evening, meal and wine is It Had to be You by Frank Sinatra. 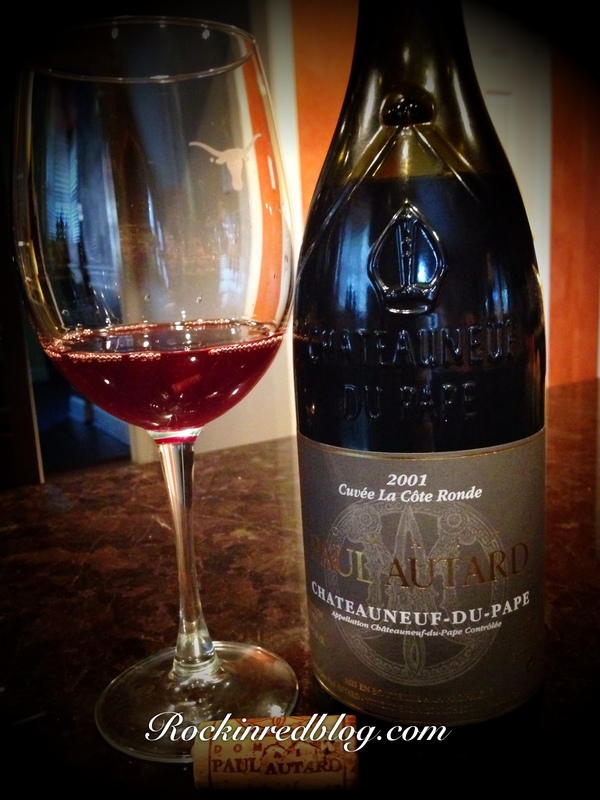 Not only is this a wildly romantic song sung by the greatest of all crooners, this sultry, refined song is an elegant pairing with the Domaine Paul Autard Châteauneuf-du-Pape 2001 Cuvee La Cote Ronde….again think Trocadero Square, macaroons, and gazing on the Eifel Tower with the one you love. 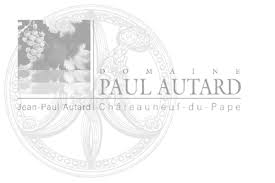 Get your own bottle of Domaine Paul Autard Châteauneuf-du-Pape 2001 Cuvee La Cote Ronde and let me know what song you would pair with it. Cheers! What a fantastic anniversary you had great wine and the food sounds absolutely delicious. A Happy anniversary to you both! I love finding Rhone wines with a bit of age in shops – far too much 2012 on sale at the moment that will never see their drinking peak! Happy Anniversary, a great meal, great wine and a great song. Everything is perfect.